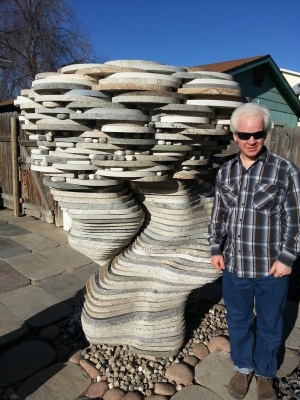 Chris has developed a unique method of stacking reclaimed materials from the granite countertop industry into a wide variety of large sculptures. Shape, thickness and size of the individual pieces as well as physics and mathematics are taken into consideration as each work is completed. Whether touring the collection for a unique experience or selecting a lifetime purchase, Chris's Granite Paradise is definitely the right place! Call for more information or an appointment! Invariably, art is a direct reflection of the artist, and as such is a physical manifestation of the sum of all that has contributed to the artist's life and experience. We hope you will take the time to read this brief summary of Chris's life as it pertains to his art. Chris has had an intense love for the natural world ever since he was a small child living in Selden, NY. During the summers, his mother sent him with his sister to summer camp in Vermont. These few weeks every summer along with some very thoughtful teachers at school really helped encourage Chris in all things science and nature. Being an albino and legally blind really helped Chris not stray into the more "normal" areas of interest that most kids follow, but rather to stay intensely focused on the two things he loved most: nature and art. At age 11, the family moved out to Billings, Montana, where he immediately fell in love with the Beartooth Mountains and in particular with collecting rocks along the Yellowstone River which was walking distance from his home. The hobby stayed with him into adulthood, until at one point he found an interesting stone that he wanted cut and polished. The search for someone to cut it eventually led him toa granite countertop place where he started working and has been in the industry as a fabricator ever since. That was in January of 1995. Over these 21 years, Chris has considered himself to be one of those lucky few who have a job that they truely enjoy. In 2008, living with his wife and three kids in Fort Collins, Colorado, Chris began to bring home the cut-outs and other interesting pieces from work, where he has been primarily involved in the cutting and finishing of the sink holes in the countertops. These piled up rather quicklyin the back yard, and so the artist's mind began to come up qith ways to use this material, which was simply to cool to throw awayy! After building a patio and walkways all around the house.. there was still alot left over, and so it was that Chris, with much help from his lovely wife and three hard-working kid, began to create what has now become Chris's Granite Paradise. The combination of the materials from the countertop industry and the other rocks and minerals from Chris's more traditional rock collecting hobby combine to produce what could modestly be called a rock garden on steroids! 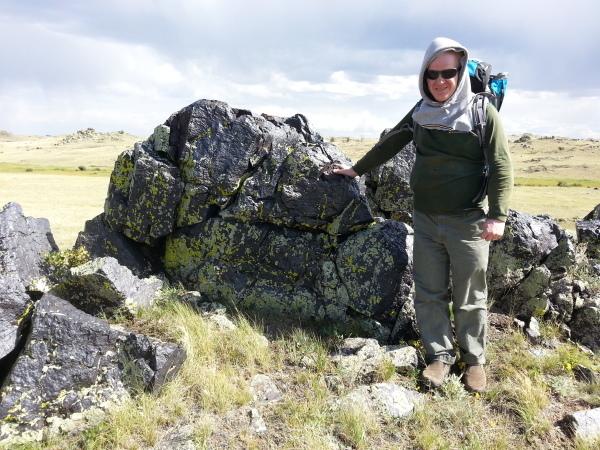 Chris is currently a memeber of the Fort Collins Rockhounds, and has several good friends with which he goes rock hunting in various parts of Colorado and Wyoming. These people have also been a constant encouragement, and without whom Chris would rarely have opportunity to obtain the vast array of unique stones that complement the sculptures in the garden. So, if you are able to visit the garden, be sure to look at the ground as well as at the sculptures! Photojournalist Major King helped Chris to really experience how much fun sharing his art could be! Chris is grateful to have had such an opportunity to be on TV sharing one of his greatest enjoyments in life. A special thanks to Mr. King, as well as to Denver's channel 7. It was mostly through this interview that Chris came to understand the true uniqueness of all that granite piled up back there! The experience was also quite fun for the family and Chris's coworkers! Just an example of some of the preparation and cleaning of the rough pieces before they can be used in a sculpture. Most of these pieces are being prepared for the sculpture to be built during the news video. Once the pieces are selected and prepared, which is by far the longest part of the process, then the actual stacking can begin. All the sculptures are dry stacked, which means that there is no glue or concrete holding them together. Therefore it is esssencial that certain measures be taken before construction to ensure stability and a tight fit. A good friend aquired permission to visit this old abandoned mine site on private land near Farthing, WY. The natural outcrop of magnetite is almost completely wind polished and sculpted. Several pieces are now part of Chris's Granite Paradise.. It's amazing to note how much the garden has changed since 7/14, though a few iteems remain unchanged. Because of the dogs, we tried not to use chemicals to combat the weeds, but due to the obvious amount of work during the summers, we have since discovered the miracle of Roundup! In this case, the weed was bindweed, which while flowering really gave a good look to the sculptures.